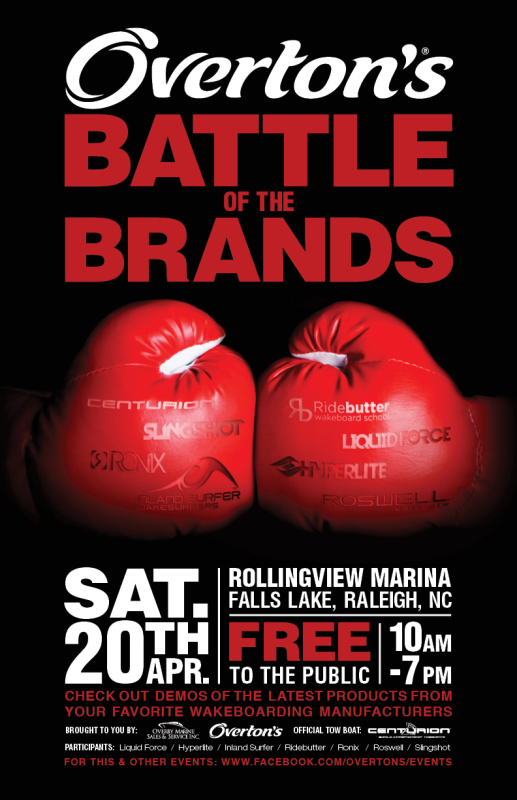 This Battle of the Brands event April 20th is an all around day of fun on both land and water. It’s 100% free to the public, yes you. For the consumer it is your chance to come check out (check out meaning = drive and ride) the latest and greatest wakeboard boats, wakeboards, wakesurfers, wakeskates, towers, speakers, and more. It’s also a time for you to meet and mingle with tons of professional athletes in the industry and watch them ride. Without a doubt Overton’s will have a huge promotion in conjunction with the event so don’t forget the wallets. Don’t let this weather scare you… The start we gotten off to this spring seems to be some type of cruel joke put on by mother nature but hopefully by April 20th things will turn around a bit. Just in case the water is still chilly, Overton’s will have Wet Suits available if you should not own one. The event is held at the beautiful Rollingview Marina located on Falls Lake. For more details, address, pro’s and brands attending give Overton’s a like on Facebook and check out their Events tab.